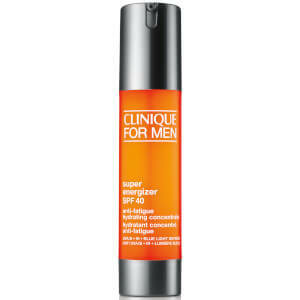 Treat tired skin to the energising properties of Clinique For Men Super Energizer™ SPF 40 Anti-Fatigue Hydrating Concentrate, a lightweight cream moisturiser that awakens, corrects and defends skin. Oil free and non-sticky, the nourishing face cream instantly energises the appearance of skin with 12-hour anti-fatigue power. 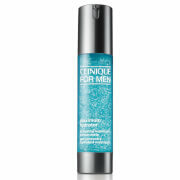 It contains a blend of Hyaluronic Acid and Glycerin for long-lasting hydration, plus energising Caffeine for a skin pick-me-up and Sea Whip extract for a soothing effect. Intensely hydrating while alleviating signs of skin fatigue, the day cream with SPF 40 utilises Multi-Layered Defense Technology which expertly shields against external aggressors known to accelerate signs of ageing, including: UVA/UVB rays, infrared and blue light. Sweat and humidity-resistant, the energising moisturiser promotes a well-rested appearance and keeps skin safeguarded against urban factors such as pollution, pollen and dust. Skin is equipped with all day hydration and antioxidant defence (thanks to Vitamins C and E). 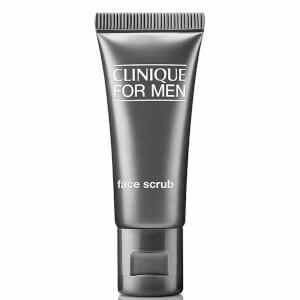 Also works over time to reduce the look of first signs of ageing, including lines, wrinkles and texture. 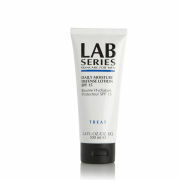 Free from oil, parabens, phthalates and fragrance.